If your water bill seems out of line, the answer may be an older toilet that guzzles over 3.5 gallons of water per flush (gpf). Lower your bills and save water with a new, low-flush toilet that uses only 1.6 gpf, provides the same flushing power, and remedies costly water waste. Ask an Elek team member for details. 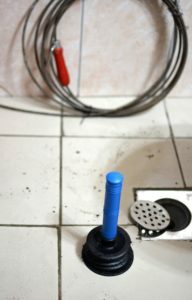 It’s no secret that h . Hair strands are easily trapped in the slimy lining of your bathroom pipes, forming a clog as they accumulate in p-traps or become tangled around drain plugs. Soap and shampoo residue, small toys, lost jewelry, and other objects also obstruct bathroom pipes. Avoid the use of corrosive and dangerous chemical cleaners when your shower or toilet is plugged. If your clog is too big a job for hot water and a basic plunger, call the award-winning Lehigh Valley plumbing professionals. Elek’s plumbing technicians are trained and certified to repair any drain clog, from sinks and showers to spas and steam systems. To safeguard your home or business from bathroom plumbing problems, purchase an affordable annual Plumbing Maintenance Agreement from the Elek Plumbing team. The plan includes routine safety and performance inspections, attractive repair discounts, and priority scheduling when trouble arises. Learn more now: 610.432.7001. Home bathroom clogs can throw off your entire day, and drain problems at your place of business are a potential source of lost revenue. Minimizing bathroom downtime and expediting any drain clog repair, Elek is available around-the-clock to solve emergency plumbing problems. To request a toilet repair or report a clogged pipe or sewer line, call the Elek SuperSTARS seven days a week at 610.432.7001. For your convenience, you can also email your request now and our office staff will be in touch shortly.